This book is the result of a project elaborated in cooperation between the IMPEL working group on criminal prosecution and METRO, with the goal of providing an insight into the systems and methods of criminal prosecution in environmental cases in practice. 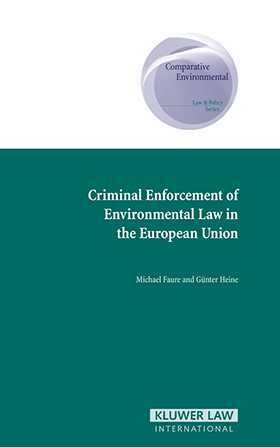 This book therefore provides an overview of criminal prosecution practice in environmental cases in Austria, Belgium, Denmark, Finland, Germany, Italy, the Netherlands, Portugal, Spain and the United Kingdom. It is based on the results of a comprehensive questionnaire that was answered by various experts in country reports. In addition, the book contains a detailed summary and comparison of the country reports. This provides not only a summary of the criminal prosecution of environmental law in the various countries, but also addresses differences and similarities in practice with respect to environmental criminal law. A critical analysis of the answers is also provided. Both in the comparative overview and in the analysis, crucial issues with respect to the enforcement of environmental law are discussed, such as the criminal liability of corporations for environmental offences, the role of enforcing bodies and individuals in connection with environmental offences, the possibility of administrative or criminal penalties, the existence of instruments which prohibit individuals from carrying out similar activities, and the criminal liability for environmental offences by public servants and public authorities. Special attention is also given to transfrontier pollution incidents. In their concluding remarks, the editors of the book address the trend towards corporate criminal liability, discuss the difference between administrative and criminal enforcement of environmental law and also pay attention to current moves to achieve a European environmental criminal law. Introduction. Summary of Country Reports. 1. Criminal Liability of Corporations for Environmental Offences. 2. The Role of Enforcing Bodies and Individuals in Connection with Environmental Offences. 3. Criminal Penalties. 4. Administrative Sanctions. 5. Existence of Instruments which Prohibit Individuals from Carrying Out a Similar Activity. 6. Transfontier Pollution Incidents. 7. Criminal Liability for Environmental Offences by Public Servants and Public Authorities. 8. Miscellaneous. Evaluation of the Answers. 1. Criminal Liability of Corporations for Environmental Offences. 2. The Role of Enforcing Bodies and Individuals in Connection with Environmental Offences. 3. Criminal Penalties. 4. Administrative Sanctions. 5. Existence of Instruments which Prohibit Individuals from Carrying Out a Similar Activity. 6. Transfontier Pollution Incidents. 7. Criminal Liability for Environmental Offences by Public Servants and Public Authorities. 8. Miscellaneous. Concluding Remarks. 1. Trend: Towards Corporate Criminal Liability. 2. Administrative or Criminal Law? 3. Towards a European Environmental Criminal Law? List of References. Annex 1: Questionnaire. Annex 2: Country Reports. 1. Austria. 2. Belgium. 3. Denmark. 4. Finland. 5. France. 6. Germany. 7. Italy. 8. The Netherlands. 9. Portugal. 10. Spain. 11. Sweden. 12. United Kingdom. Annex 3: Convention on the Protection of the Environment through Criminal Law. Annex 4: Resolutions of the XVTH International Congress of Penal Law (Rio de Janeiro, September 4-10th 1994).